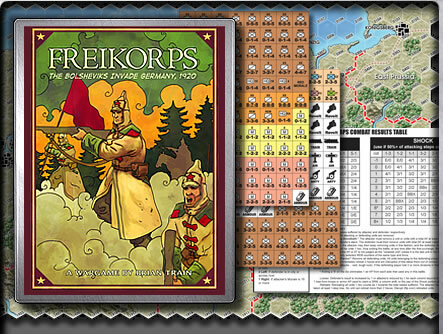 FREIKORPS is a simulation game depicting a hypothetical invasion of Germany by the Soviet Unionâ€™s â€œRed Army of Workers and Peasantsâ€� in 1920. The game is designed for two players, one representing the irresistible forces of proletarian revolution (the Red player), and the other the impervious alliance of anti-Bolshevist forces that would have been arrayed to oppose such an invasion (the White player). The game begins just after the Red playerâ€™s forces have won the Battle for Warsaw in August 1920. Sensing that the time is ripe to â€œcarry Revolution to the rest of Europe on the points of Red bayonets,â€� the leadership of the Soviet Union has decided to seize Berlin, capital of a Germany in political and economic disarray. However, it is already mid-summer and the Soviet Union cannot sustain a military effort of this size past the onset of bad weather at the end of October. The Red player has just ten weeks to change the course of world history.